In this blog, we shall discuss how advertisers can set up dynamic remarketing for eCommerce stores using AdNabu. Note: If you are still new to remarketing and dynamic remarketing, please read our dynamic remarketing campaigns blog before you proceed further. Once you have finalised the AdWords and Merchant Center accounts you want to use, install AdNabu Dynamic Remarketing app and follow the below steps to fulfil the prerequisites. Connect your AdWords account – After you’ve installed the AdNabu app, you have to connect it to your AdWords account. Link your Merchant Center – Once you’ve connected your AdWords account to the AdNabu app, you will be prompted to link it to your Merchant Center. Verify your details – The final step is to verify AdWords, Merchant Center and target country details. Voila! You have successfully set up Dynamic Remarketing App. What does AdNabu Dynamic Remarketing App do? 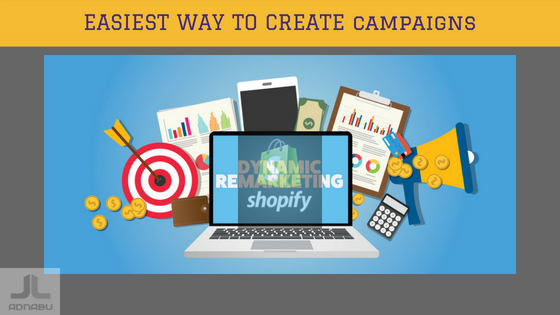 How to create Dynamic Remarketing Campaign? After setting up the app, it will install remarketing tags and create audiences. 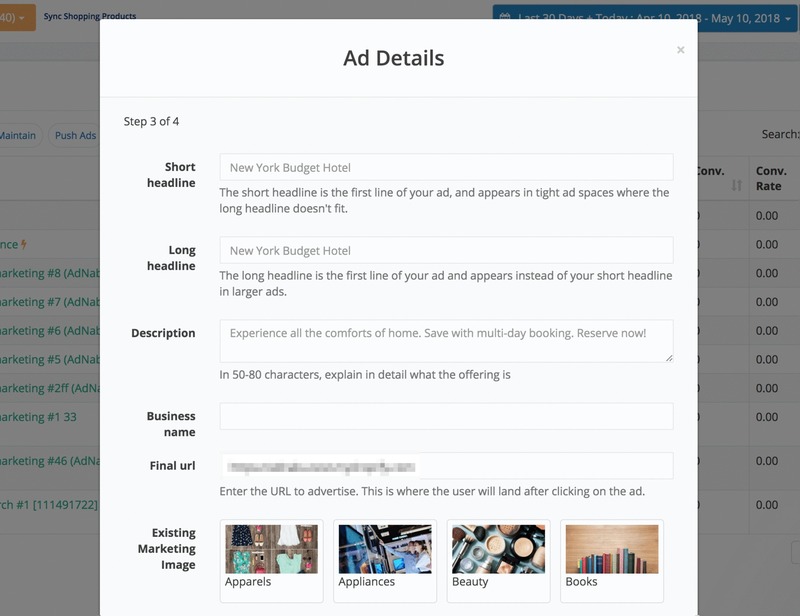 AdNabu then prompts you to create your dynamic remarketing campaign. Follow the screenshots below to finish the campaign creation process. You have to select your Merchant Center details from the drop-down in the first field. Then you give your campaign a name of your choice in the second field. 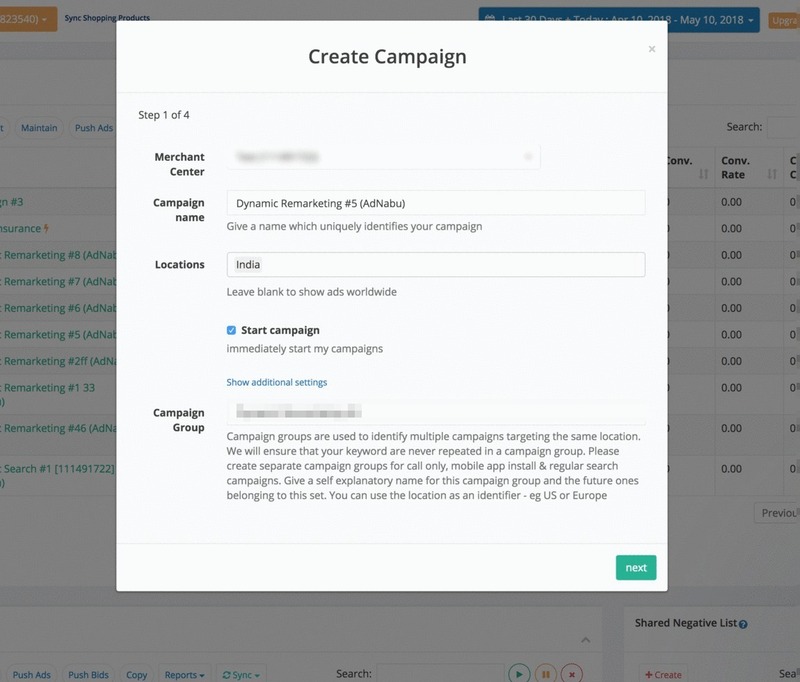 Select the location you want to target in the third field and a campaign group in the fourth. Click next. 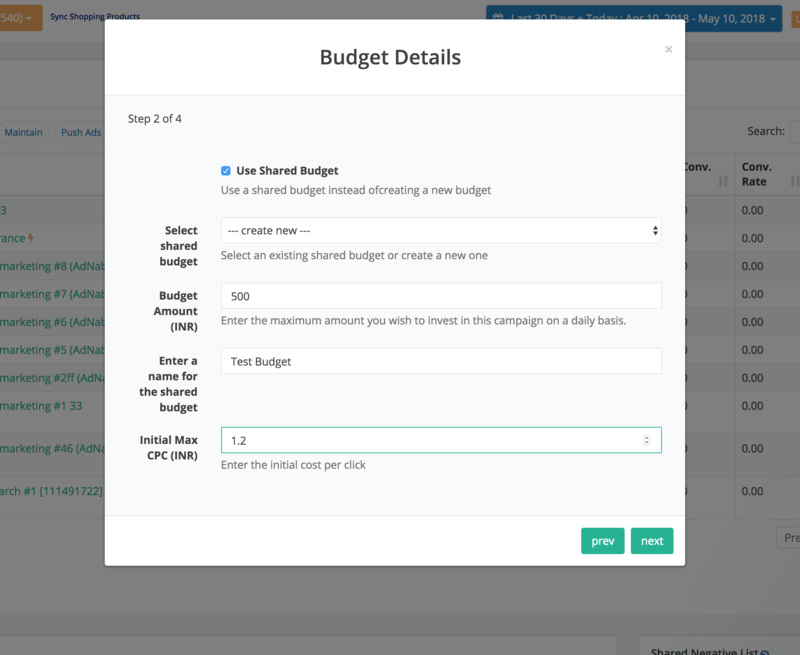 dynamic And in this step, you have to define the budget and bid for your remarketing campaign. Start by selecting an existing budget, or you can rather create a new one. Set the amount of your daily budget and a name for this budget. Now pick a maximum cost-per-click (CPC) for your remarketing campaign. Click next. Create a short headline and a long headline along with a description of your remarketing ad. The short headlines are alternatives to your long headlines. Google shows the short version when there the ad placement is such that extended version can’t fit. Enter your business name in the fourth field and the final URL/ landing page URL in the fifth. 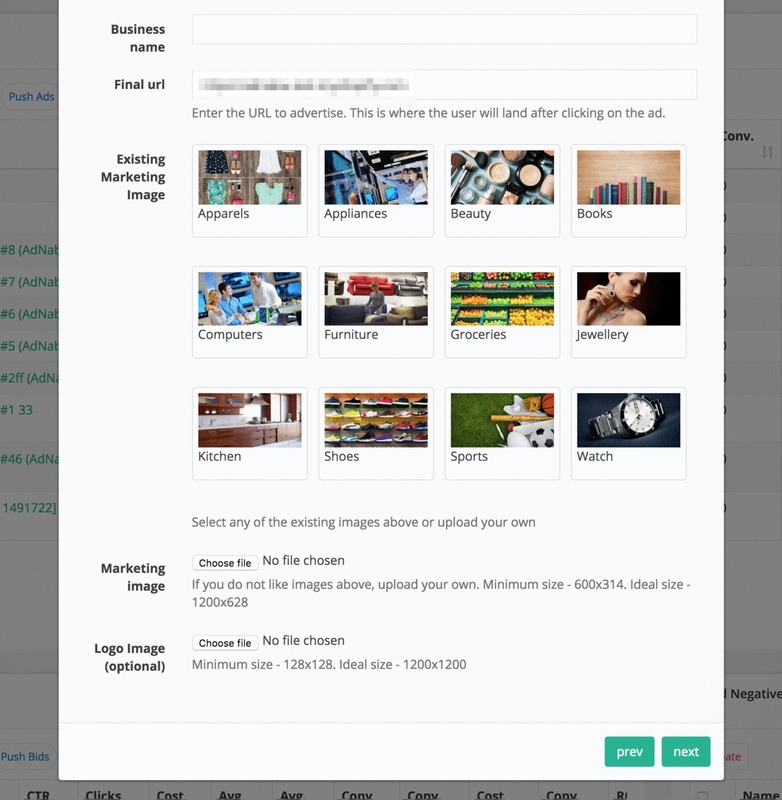 You also have to select marketing images and a logo for remarketing ads. You can either use the ones we have provided or upload your pictures. Your business logo is optional, but it is best that you upload it. Click next. 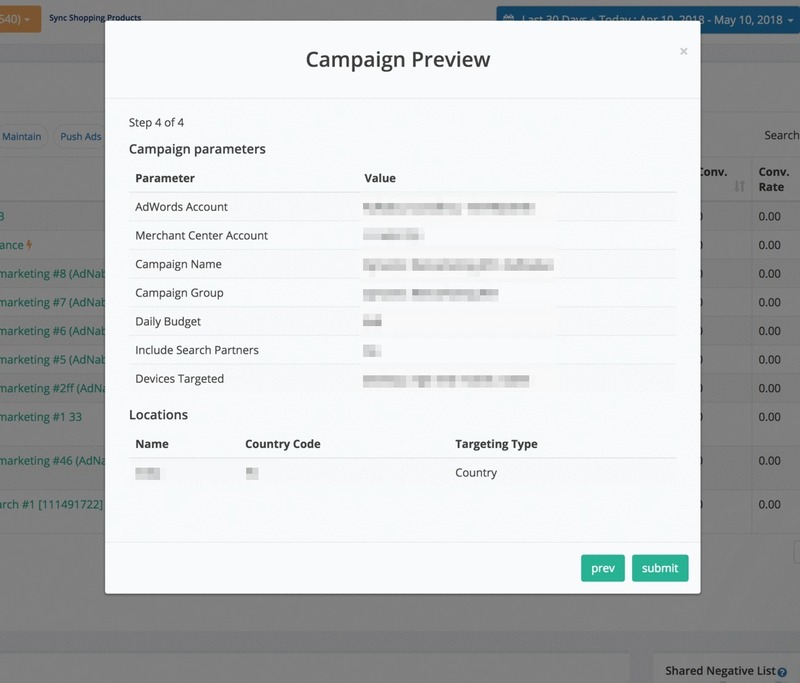 In the final step, you have to review your campaign details and confirm them. Once you are ready to launch the campaign, hit submit. And if you want to make changes, go back to the previous slide by clicking the previous button. Note: Read the descriptions below each box to understand what they mean. Dynamic Remarketing for eCommerce stores has numerous benefits without a doubt. For eCommerce is unlike most online businesses, due to the size of the product inventories and regular traffic, generic ads and promotions aren’t always effective. Dynamic remarketing allows you to reach individual customers with a message that is personalized for them. It shows that you care. There is a better chance of your customers buying from you and be loyal. To sum up, dynamic remarketing campaigns are effective in improving your online presence and thus creating your brand awareness. You will see more customers returning to finish the purchases they left midway. Your customers will also turn more loyal as you understand them better and show them what they want to see. Setting up may seem a bit overwhelming, but worry not, we have got your back. From implementing tags to creating audiences, we do it all. You can also register for a free trial with AdNabu and experience the brilliance of AdWords automation and optimization. Furthermore, learn to use Remarketing Lists for Search and to create similar audiences for Shopping ads and various other AdWords topics here.